During the End Phase, if this card was Normal Summoned this turn: Return it to the hand. You can only use each of these effects of "Yosenju Tsujik" once per turn. 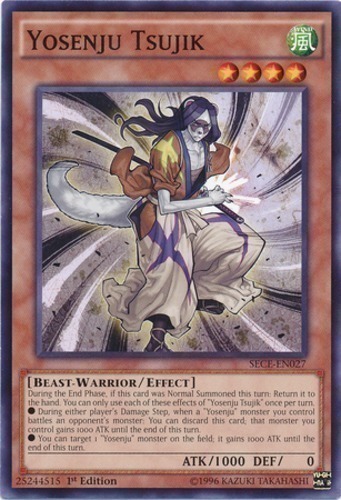 ● During either player's Damage Step, when a "Yosenju" monster you control battles an opponent's monster: You can discard this card; that monster you control gains 1000 ATK until the end of this turn. ● You can target 1 "Yosenju" monster on the field; it gains 1000 ATK until the end of this turn.